If you are looking for a cheaper alternative, then I would suggest Garmisch and the Zugspitz arena, which is several resorts in Austria including Ehrwalder Alm and Lermoos. Your girlfriend could meet you on the top of the Zugspitz mountain or in the Tirolerhaus in Ehrwalder Alm. Most of the skiing included in the lift pass is on blues or easy reds. The whole area has spectacular scenery, although to be fair that does apply to almost every ski resort. Garmisch is a regular German town, with skiing attached. It is also about an hour from Munich by train. I've not been there, but wondering whether Granada/Sierra Nevada might be an option for you? Big vibrant Spanish city with close by skiing. From what I've read on here, it seems the Spanish like a lie-in so the slopes are quieter in the morning. Hi Peter - first, I think it's great that you have started ski-ing in your 50s and clearly love it! It's also really interesting to hear your opinion on ski-ing, while learning as a relative late-comer (says he, as a now 60-yr old, who was probably once one of those pesky children you mention . Chamonix, being a town, is good, but I think you'd may find the ski-ing not particularly suitable for yourself. Val d'Isere has a towny feel about it, plus swimming and other activities. Zermatt is very scenic, with lots of shops etc, and maybe a scenic train ride or 2 for her, either up the mountain or down into the valley. Austria and Swizterland tend to have the more scenic resorts, ie not purpose-built. Not sure about yoga - some resorts have sports centres, which I guess may offer classes. Massages seem to be the popular choice for skiers. One other thought - has she tried cross-country ski-ing? It's actaully great fun, along scenic trails, not particulalry dangerous, and also sth that you could both do together. I did it a few times with my wife when she was pregnant, and really enjoyed it. Good luck and I wish you well in your endeavours! Kitz area (maybe Kirchberg on the other-side of the mountain) - if she likes spa/sport hotels? Your lady friend could easily get to Innsbruck or Salzburg, etc in an hour or so. You could even meet her in Kitz for lunch & when she makes her way back to hotel via train/taxi, you can ski back. Also maybe Sierra Nevada as suggested above could be worth a look if you looking at late spring skiing. Have a look at Les Carroz (1200m, local lifts up to 2120m, Flaine lifts go up to 2500m), we (and many other people we have met there and family & friends) have done multiple seasons/holidays there. 1 hour from Geneva, easy transfer. You can ski to all Grand Massif resorts on blue runs. Easy to get 1st lift in the morning, ski bus takes 1m30s from village centre. Out of French school holidays is quiet, outdoor vin chaud and concert every Monday evening, Outdoor village market every Tuesday, plenty of forest walks (even walking up to some mountain restaurants). Large indoor & outdoor swimming pool complex which also has relaxing sun beds, sauna, steam room, gym, jacuzzi etc. Huskey sleigh rides, evening snowmobile tours, local bus (payable) up to Flaine for non-skiers (about 20minutes) to meet you for lunch in Flaine. There are a few British run chalets if you like to be catered for, they will drive you to/from slopes and also offer advice on non-skiing activities. I could go on and on. You can ask questions if you are tempted. Trying to stay off the shoals of the thread drift here...@peter_h, is asking for advice for his GF. He's obviously comfortable with where he is now. So, with that in mind, what about Garmisch-Partenkirchen? The town is great and you can get to medium difficulty skiing pretty easily. I've only been once, but definitely recall the skiing as being not terribly hard and Garmisch as being lovely. @peter_h, take a look at what Megeve has to offer. Easy access from Geneva. Lots of the type of skiing you say you enjoy. Not crowded except at peak season French school holiday times. Stunning mountain scenery. Attractive town with a very good leisure/wellness centre. Plenty cafes, bars, restaurants etc. Not usually a cheap option but less expensive than Courchevel, which you seem to have visited several times. "But as far as I remember you have to go up from the town in gondolas (which were pretty packed when I was there) so a skier and a non skier are pretty well separated for the day." If you have a gondola, a non-skier (with a ski pass) can use it. This works great for meeting up for lunch. It is the chair lifts etc on which they don't allow non-skiers. "get a new (skiing) girlfriend"
I'll post my usual response to this sort of question and suggest that you stay at a spa/Wellness centre, and your girlfriend remains resident while you perhaps try out the local ski places by car. The area I'm familiar with is the French-speaking Swiss Valais, to the NE of Lake Geneva and one place I can recommend along these lines is the Bains de Saillon: https://www.bainsdesaillon.ch/en/ in the valley between Martigny and Sion. THis is the largest thermal spa in southern Switzerland and is a bit more mainstream than some of the better-known but more expensive luxury 5-star places. You'd then have the choice of a wide variety of places to ski within a short drive - Verbier, Ovronnaz, Nendaz, Veysonnaz, Crans-Montana and many others. There's also the MagicPass https://www.magicpass.ch/en/ for this area which allows you to by one pass for 30 resorts. Your girlfriend would also have the opportunity to get the train to the Martigny (which has a famous modern art museum at the Fondation Giannada http://www.gianadda.ch/visites_pratiques/practical-information/) or Sion, or slightly further afield to Montreux and Lausanne, or even a day's shopping in Geneva. Or perhaps a boat trip across Lake Geneva (Lémain) in one of the Belle Epoque steamers. I'm sure there are similar places all over the Alps - I only suggest the Bains de Saillon because I'm familiar with it. The Swiss National Tourist site has more information on other areas, seehttps://www.myswitzerland.com/en-gb/home.html. Try Skye Niseko. Great Skiing, and superb facilities for nn skiers. What is your idea of 'plenty to do'? Do you think she would like other outdoor type activities, just not skiing? Or are you thinking more spa / galleries / city break type activities? If she would like other outdoor type activities and you like the more relaxed skiing, I would suggest Saariselka (Finland). There are probably other more indoorsy type things to do too, but we didn't look for them. It can obviously get very cold, so going in March time I guess would be both warmer and lighter, but for a change of scene and somewhere a little different, it might suit you both. Chamonix is a great town for the non skier but I’m not sure about being so easy to be first to the lifts etc as the OP has described? And there is a bit more travelling up and down the valley rather than everything being centred in the one town, if he likes to finish at 3 and then meet up with his girlfriend. Cervinia ticks the boxes for him, but not so much for her, as although there are some nice hotels with good facilities, there’s not really much to do otherwise for the non skier. I think she would like Zermatt, and there is quite a bit of the cruise type of skiing described up above Trockener Steg and on the slopes at Gornergrat, all of which she could reach by lifts to meet up for lunch. There are gyms in a number of hotels, or access to gyms for a small fee if your hotel doesn’t have a gym. Likewise plenty of Spas, a cinema, mountain museum and so on in town. Yoga and Pilates classes too I believe. There are also a number of well marked winter walking trails. It would be wrong to pretend it’s cheap, but it does offer a great all round ‘mountain holiday’ experience. There are a number of smaller 3 star type hotels which are very high quality (would be 4 star in many other places) which might not break the bank in the same way some others would. We are always struck by the number of multi generational families many with non skiers in their number, that we see on holiday there. It’s a nice dilemma to have, choosing from all of these suggestions - good luck! These might be of interest to her? I mentioned earlier she likes gym, yoga, Pilates, swim, food, reading, writing, etc and yes the outdoors too but not if it is too cold. Last time, Madonna Feb 2018, it was -20C and a bit of wind, and she found that too cold to hang out outdoors. Not because I've been, but because this is where I'd want to be for wellness/reading/yoga/inspiration for writing... the Adler Mountain Lodge in Alpe de Siusi might be worth checking out, looks glorious, pistes for you, gondola down to Ortisei (and further skiing), total luxury for the non-skier, and because it's Italy, food glorious food. Go, and report back, then I can sell it to my other half. Otherwise, was also going to suggest Grenada/Sierra Nevada. Was going to say I agree with @ski3, Flaine is an option and I'd give Chamonix a miss as the skiing is spread out. Then saw that @skier52, recommended Les Carroz, as an option and wanted to say it is a great choice and there are classes at the pool complex. It is a very relaxed place though, so not got hopping apres and overly chic shops. I have found that piste maps tell you very little about what the slopes actually look like, and google/images for these two do dig out interesting slopes. Now just need to see how the snow pans out... Last winter was amazing from early December. I think Cervinia has the sort of skiing you are after - Zermatt not so much. @peter_h, Madonna is lovely and very pretty scenery and I really like it there, however Cortina has it all with bells on!!! Kitzbuhel, Garmisch and Davos tick the right boxes. It is going down from Passo Groste. About 2400m. My two videos above were taken there. It is the best ski run I have seen so far, for me. Good distance too. There is one blue (to the right of the pic) and one red (to the right of that, behind the chair lift). I could do both. There is a good restaurant at the top; two actually, with the posh one above the cheaper one. +1 for Kitzbuhel Chamonix, and Bad Gastein. Have a look at Briancon in the Serre Chevalier. A proper town with a ski lift and she can get a bus to the thermal spa at Monetier. Check out Bormio - have a look at bagni vecchi and bagni nuovi hot springs. It's a sizeable and classy town with decent high altitude cruising. We regularly have non-skiers accompanying their skiing partners or friends, and they seem to have a great time. The resort has the highest number of gondolas of any resort world-wide, and there are no less than 15 very nice restaurants at the top or middle stations of the most accessible gondolas - ideal for arranging rendezvous up the mountain. It is easy to find slopeside (ski-in ski-out) accommodation, so easy to get onto the first gondola with no or minimal walking involved. Unlike some of the options under consideration, there is a very lively apres-ski party scene, with much jollity of the singing and dancing variety at numerous venues between 4.00pm and 7.30pm. All of the main apres-ski party places are at or near resort level, so easy for non-skiers to get to them - the most well-known are the Hinterhag Alm, the Goassstall, Bauer's Schialm, the Spitzbub, the Schwarzacher, and the Hexenhauesl. Later in the evening there is an entertaining apres-apres-ski scene, with such activities as ten-pin bowling, tobogganing, ice skating, curling, bars with live music and various night clubs. There are also possible day trips to Salzburg (dress as a nun or a goatherd and go on a Sound of Music tour, or immerse yourself in all things Mozart), and of course Zell am See with its beautiful lakeside walks. A highlight of many people's week is the Spielberghaus toboggan evening (ride up in a cage on the back of a piste basher, have a meal and a party, then toboggan down a gentle track for two or three km). Horse-drawn sleigh rides to the Lindlingalm are also popular with the romantics. A non-skier might well be happier in a proper village or town than a purpose-built ski station, for obvious reasons. Also in an apartment (home from home, rather than a hotel room), with a decent TV capable of receiving UK channels and a a DVD player with an assortment of films (in case the weather's bad). If the non-skier has the ability and desire to travel a few miles, there are lots of other possibilities, including the Tauernspa at Kaprun and llama trekking (yes, taking llamas for a walk) at Leogang. Saalbach does look like it has some reasonably wide runs, though it is hard to tell from the images I can find. It certainly has plenty of long blues. Totally want to do THAT! Peter your photos and videos look absolutely beautiful, I'd just go back there!! How about St Moritz? It can be expensive, but you can find some good deals. There´s a wonderful swimming hall/spa complex, several villages to explore, nordic skiing, a couple of museums, horses... The pistes would be fantastic for a happy cruiser like yourself. And very, very few people on the pistes the one week we were there. Maybe everybody else was out shopping? Chamonix is an actual small town so probably would have stuff to do for your girlfriend, but as stated before, maybe not your cup of tea as for skiing. A friend and his group usually goes to Bad Gastain because the non-skiing wives like it there. But I have no idea how the slopes are. From the videos you posted, saalbach would be great for you, especially the runs over the Leogang side, lovely. There are videos of many of the runs on youtube by the way (I spend a lot of time staring at them myself). Having watched a load of Cortina, St Moritz and Saalbach videos, there is plenty of great scenery but I haven't seen anything anywhere near Madonna in terms of long and wide runs which aren't steep. Saalbach videos, there is plenty of great scenery but I haven't seen anything anywhere near Madonna in terms of long and wide runs which aren't steep. Having said that, there are some people who like to just stick with what they know and love, and what they feel is within their comfort zone, and you may be one of them. You seem to have a definite preference for "motorway skiing", and, whilst most resorts have something of that sort to offer, there will usually be plenty of more challenging runs too. Much depends on whether you view a challenge as a welcome opportunity to practise and develop, or a pain in the backside. Bear in mind that Austria doesn't have green runs, and the blues tend to encompass, not only very easy runs of gentle gradient, but also those that can be quite challenging, especially later in the day when moguls have started to appear. Although Saalbach has 140km (out of a total of 270km) of blue runs (including some of up to 7km in length), some people have occasionally remarked that some of its blues are a little harder than what they have become used to elsewhere. I know that one of those people had previously been a few times to Les Carroz. Just carry on (as you are) doing research, but, if I'm right that you want to avoid resorts that will challenge you, bear in mind that some of the suggestions in this thread may not be appropriate - for example Cervinia is likely to suit you much more that Zermatt, and Chamonix does not exactly have a reputation for easy skiing. 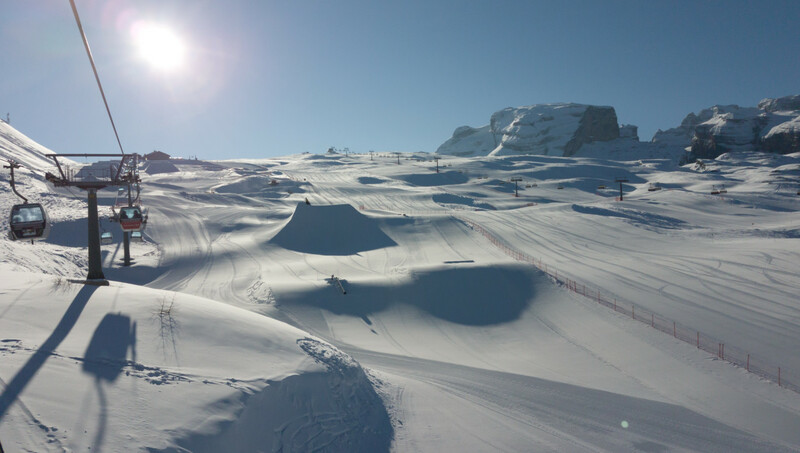 Cervinia has plenty of flat long boring runs if that's what really floats your boat and places like La Plagne etc are custom designed with that market in mind. Norway is also good for wide and flat - good saunas as well! Might be something different? Well found; many thanks, tatmanstours. What some people (mostly young ones) call a "challenge", I tend to view as an opportunity to break a leg At 60+ I don't really fancy it. It is a common thing but I don't fancy miles of it. There was a lot of it at Wengen for example. We don't see (m)any "Things to do for a non-skiing husband/boyfriend" threads. Re skiing, I could go on my own and my GF would probably find somewhere (somewhere warm!) to go, but I much prefer to spend a holiday with her, which is why I am looking for a nice place for her. I ski only a few hours each day... I do know people who ski (they are the ones who talked me into it originally ) but they have their own partners, and all of them are much more advanced skiers. I did also look into some group things a while ago but all of them were pretty advanced level. Interesting points about partner choice. Hopefully you will find somewhere suitable for each of you. Fingers crossed!